Check out these removable aluminum fasteners often used for photo albums, swatch books, architectural and engineering drawings, menus, and many other applications where loose sheets need to be kept together. These aluminum screw binding posts are sometimes called Chicago screws or Chicago screwposts, and they consist of two pieces (screw and post) that are designed to be inserted into round hole punched papers and covers. Screwposts are perfect for binding large documents and can even be combined with screwpost extensions to reach any length you might need. The post length for these screw posts are ranging from 1/8" - 5". This means that the maximum binding thickness for these screw posts are 1/8" - 5". For best results and to ensure a correct fit, please measure your document thickness and ensure that it will fit. but genius operates in its own mysterious ways...! Great! Good quality product. workes good for our large product. I enjoy doing business with Mybinding. I have had a wonderful experience. Lorena is friendly, professional and knowledgable. Because of Lorena, I have purchased the correct post for the school project. This item was a customer request for a leather item I was making. It worked well, although in a random grab of 5 pieces I found one of the 5 shanks not to have its internal threads. If the deal I’m working on with the customer goes through, I will be needing many more boxes. Based on what I’ve found, and the quantity per item I will be needing, I will be forced to order more than I need just to insure I end up with the proper amount. Something fell through during quality assurance. They are what I ordered. Right size. As described. Perfect fit. I forgot one key thing. Aluminum is lousy as a product where, an aluminum screw is screwed into an aluminum post! Goes in great but unscrewing is tricky if even possible. Had to hacksaw 3 of them to get them apart. Just what i needed for a woodworking project prices outstanding. Thanks the web sit is easy to find things I'll be back in the future. Does your barrel take a #8-32 screw ? Thank you for your question. This product comes with both sides of the screw post. However they the #8-32 would not fit within this particular post. How many sheets will a 1'' screwpost hold? Screw posts can be flush with the paper that it binds. So that means it can hold from 180 to 220 sheets depending on how thick the paper is you are using. This is a rough estimate. We can always send samples if you want to test before you place your order. What size screw posts should I buy for 160 pages? Thank you for your question. It would depend on the thickness/weight of the paper you are using. For standard 20# copier a 3/4" screwpost should work. In general the best way to "fit" a screw post to the document is to measure the thickness of your document and buy a screwpost that matches that thickness. This "trick" doesn't work with other binding styles but it does with screwposts. do these come with both the "male" and "female" side or are they sold separately ? 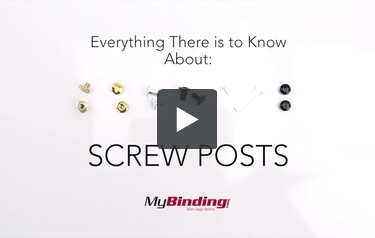 All of our screw posts come as a complete set with both the male and female sides.